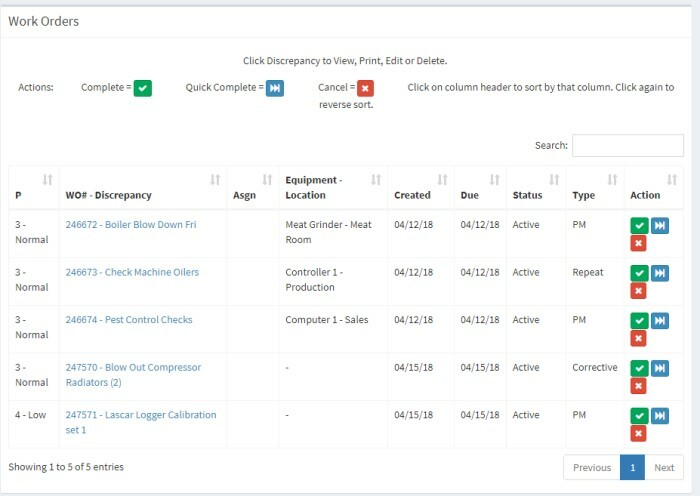 The work order screen allows you to quickly see what work orders you have open, priorities and types. Click the "work orders" tab in the Menu bar. Priority, Description, Assignee, Equipment, Created Date, Status, Type, Complete/QuickComplete/Cancel/Edit Options. The table is sorted according to settings in the "Configuration" page. You may change these by going there. To View or Edit a work order simply click the "WO# - Discrepancy" box for the WO you wish to work with. You can then click Complete, "Quick Complete" or "Cancel" to perform tasks on any line. Cmp - Complete WO. Will take you to a screen where you can put hours, parts, notes etc. and close the WO. Qcmp - Quick Complete. Will immediately close the WO and decrement any parts (if PM). Cnx - Cancel WO. Will Cancel the WO but leaves it in the database. You can view it or change status again later. Pretty simple. A nice little snapshot of what you have to do!